Note: See Solar Santa Fe for perspective view. 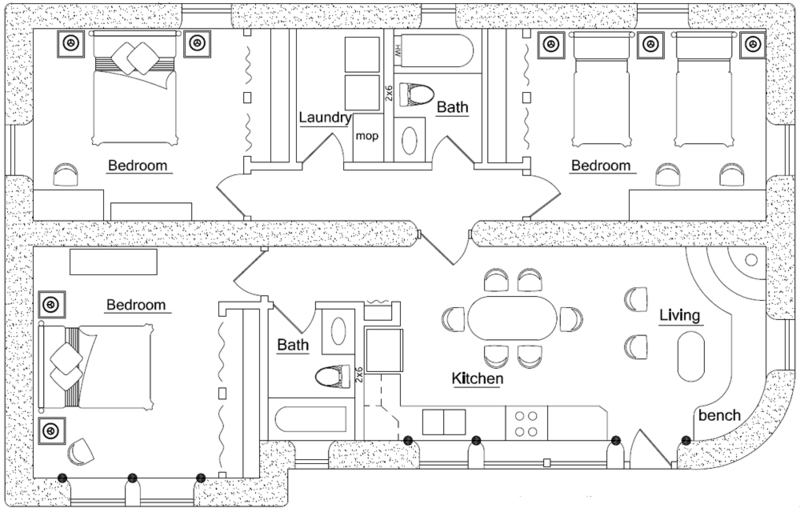 Description: This is a three bedroom version of the Solar Santa Fe design. Both are designed to optimize passive solar. A tiled roof along the south side is sized to prevent overheating in summer, but allow maximum solar gain in winter. Quality detailing is evident throughout — open, comfortable layout, rough-hewn posts and vigas (round roof timbers), built-in bench and kiva-style fireplace (or wood stove insert). On the cooler east side is a large outdoor flagstone patio (not shown). Description: In addition to the charm of typical Santa Fe homes, this house is designed to optimize passive solar. A tiled roof along the south side is sized to prevent overheating in summer, but allow maximum solar gain in winter. Quality detailing is evident throughout — open, comfortable layout, rough-hewn posts and vigas (round roof timbers), built-in bench and kiva-style fireplace (or wood stove insert). On the cooler east side is a large outdoor flagstone patio (not shown).